!! Decanters & bottles sold out !! We released our 2007 Single Cask Bottling in the early part of the year this time, having spent several months negotiating with various distilleries and bottlers before eventually deciding on a Glen Grant held at Duncan Taylor & Co. in Huntly. Again, several samples were tasted and discused before we decided on cask No 861, first fill sherry cask distilled on Monday 9th February 1970 and remaining undisturbed in it's cask for just over 37 years! When bottled on Wednesday 28th February 2007, the angels only agreed to let us have 153 non-chill filtered bottles (700ml) at the natural cask strength of 53.0%. Of these, 147 were bottled as pictured below and are now sold out. The final 6 were held back until the end of April 2008 for release as a "super elite" limited edition in especially commissioned, engraved Glencairn Crystal decanters ~ pictured above. They were available at £200.00 each and rapidly sold out. Maggie Riegler of the Greenhall Gallery in Craigellachie was yet again, for the 7th time, commissioned to produce the label in her own inimitable style ~ note Tatsuya's 1970's VW Beetle is still there, but now joined by Duncan's 2 Springer Spaniels ~ Coco & Chino ~ at the bottom of the picture! The original painting hangs proudly in the bar. Each bottle is accompanied by its unique numbered certificate of authenticity, signed by &Co. who bottled it for us. 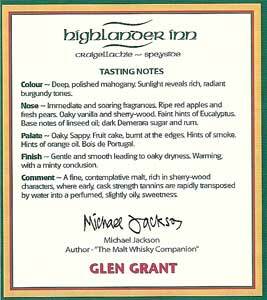 Michael Jackson, the world's leading Whisky Writer, once again agreed to write the official tasting notes which are shown on the back label. 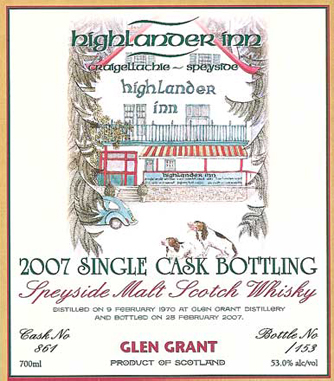 It was available for purchase from the Highlander Inn but has now sold out. It is still available to buy by the nip (25ml) in the bar at £15.00.